FARMINGTON - A new scholarship fund benefiting community college students studying precision machining and manufacturing was launched Wednesday at a conference at Tunxis Community College. The Precision Metalforming Association is sponsoring the scholarship and presented its initial $30,000 donation at the conference, which was attended by U.S. Sen. Chris Murphy, D-Conn., local manufacturers and officials from the state’s community colleges. Tunxis Community College, Middlesex Community College and Naugatuck Valley Community College received $10,000 apiece for their scholarship funds. The scholarship will be awarded annually to TCC, MxCC and NVCC students starting in fall 2019. Scholarship recipients will get $1,500 each. They must be involved in the manufacturing and machining program, demonstrate financial need and be in good academic standing. Children or spouses of employees of a PMA member company also qualify for the scholarship. Lombella said Connecticut manufacturers have stated that they will need 25,000 skilled workers over the next decade. 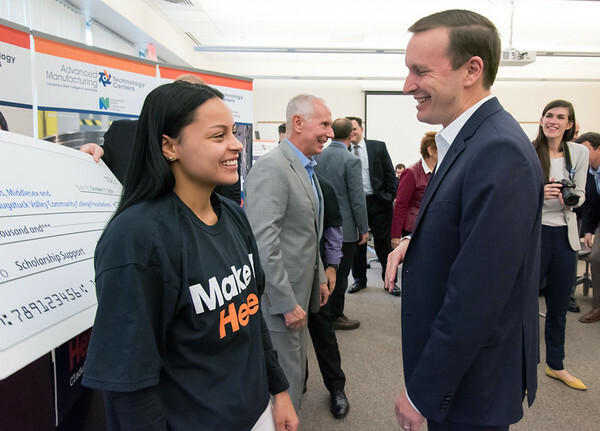 Murphy said making sure the state’s workforce is ready is important, adding that the state has taken risks that have led to in increase in the number of manufacturing jobs here. Daisy Cocco De Filippis, president of Naugatuck Valley Community College; Jason Howey, president of Okay Industries; Mark Ojakian, president of the Connecticut State Colleges and Universities; and two students currently enrolled in the manufacturing program also spoke at the conference on the impact the manufacturing industry is making on employers and students. To learn more about Connecticut’s advanced manufacturing technology centers, those interested can visit www.ct.edu . Posted in New Britain Herald, General News on Wednesday, 17 October 2018 21:23. Updated: Wednesday, 17 October 2018 21:26.